Space shuttle Atlantis and 7 astronauts land on Runway 33 at NASA Kennedy Space Center's Shuttle Landing Facility on Nov. 27, 2009 - a day after Thanksgiving - concluding the STS-129 mission. The space shuttle Atlantislaunched on its second to last spaceflight, the STS-128 mission, on Nov. 16,2009 to deliver a huge shipment of vital supplies to the International SpaceStation. Commanded by veteranspaceflyer Charlie ?Scorch? Hobaugh, Atlantis flew an 11-day mission anddelivered about 27,250 pounds (12,360 kg)of vital spare parts to the station in order to extend its lifespan. Theastronauts celebrated the birth of a crewmate?s daughter while they were inspace (the little girl was born on Earth) and spent Thanksgiving in orbit. Below is SPACE.com?s specialreport on Atlantis? STS-128 mission, which marked the fifth shuttle flight ofthe year in 2009. This page was updated on Nov. 28, 2009. Space shuttle Atlantis landed safelyin Florida early Friday, gliding in under sunny skies to wrap up a successful 11-daydelivery mission to the International Space Station. 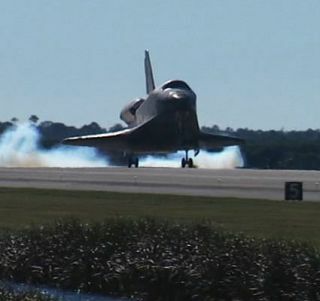 The seven astronauts aboard spaceshuttle Atlantis are hoping for clear skies above Florida so they can returnhome today. A dozen astronauts in orbit took a breakfrom their orbital work Thursday to celebrate a weightless Thanksgiving,despite the fact that they're flying on two different spaceships. They may not have the traditionalfixings for a Thanksgiving dinner, but the seven astronauts returning to Earthonboard space shuttle Atlantis are set to show their thanks with amemento-stuffed locker for those who made their mission a success. The space shuttle Atlantis and theInternational Space Station are separately flying around the Earth untilFriday, and they can be seen as a pair of bright lights in the sky at certaintimes over the next few days. The space shuttle Atlantis cast offfrom the International Space Station early Wednesday after almost a week linkedto deliver vital spare parts. The seven astronauts on shuttleAtlantis have bid farewell to the crew of the space station and are gearing upto undock on Wednesday. The crew of the shuttle Atlantisplans to spend today wrapping up work at the International Space Station (ISS)in preparation for departure tomorrow. Two NASA astronauts completed theirmission's third and last spacewalk Monday, installing a new science experimentand an oxygen tank outside the International Space Station. Two astronauts, one a proud new dadfor the second time, will venture outside the International Space Station Mondayon the third and last spacewalk of their mission. Astronauts aboard the linked shuttleAtlantis and International Space Station took some well-deserved time offSunday to rest up from their mission to stock up the orbiting lab, with onespaceflyer overjoyed after hearing news of the birth of his new baby daughter. Two astronauts raced through thesecond spacewalk of their docked shuttle mission at the International SpaceStation Saturday, getting so far ahead of schedule they took on jobs scheduledfor future excursions. Talk about one proud papa. AstronautRandy Bresnik beamed with joy Sunday after hearing news of the arrival of hisnew baby daughter, who was born on Earth while he orbited above on theInternational Space Station. Astronaut Randy Bresnik may beexpecting his wife Rebecca to give birth, but that hasn't shaken his focus fora planned spacewalk outside the International Space Station today to installnew video antennas and other equipment. NASA has joined astronaut RandyBresnik, who is in orbit now, in the waiting game for the birth his daughter,just one day before the spaceflyer is poised to make his first spacewalk. Astronauts on the linked shuttleAtlantis and International Space Station said Friday that they're not worriedabout recent false alarms that disrupted their sleep with erroneous reports ofcalamity. It may be the mother lode of all badtiming: Atlantis shuttle astronaut Randy Bresnik is stuck at the InternationalSpace Station, hundreds of miles from his pregnant wife Rebecca, who isexpected to give birth to a baby girl as early as today. Two astronauts breezed through thefirst spacewalk of their mission Thursday as they upgraded the InternationalSpace Station with a spare antenna and other gear. Two astronauts will step out of theInternational Space Station today on the first of three spacewalks to stock theorbiting lab with spare parts. The space shuttle Atlantis and itscrew of six arrived at the International Space Station (ISS) Wednesday to dropoff some massive spare parts for the orbiting laboratory. NASA's space shuttle Atlantis isclosing in on the International Space Station and on track to link up with theorbiting laboratory later today. WASHINGTON ? Astronauts aboard NASA'sspace shuttle Atlantis inspected their spacecraft's sensitive heat shieldTuesday for any signs of damage incurred during launch. WASHINGTON ? The space shuttleAtlantis roared into space Monday afternoon to begin a vital 11-day deliveryrun to the International Space Station. WASHINGTON ? NASA hailed the flawlessliftoff of space shuttle Atlantis Monday, a space shot that marked the agency'sfifth shuttle launch of the year ? a flight rate not seen since 2002, beforethe tragic Columbia accident. WASHINGTON ? The space shuttleAtlantis is poised to soar into space Monday to ferry six astronauts and tonsof spare parts to the International Space Station. The skies above NASA's Floridaspaceport look to be clear for tomorrow's planned launch of the space shuttleAtlantis. NASAis about to open space shuttle launches to a whole new audience. NASA cleared the space shuttleAtlantis to launch toward the International Space Station Monday on a deliverymission. NASA is on track to launch the spaceshuttle Atlantis on Monday, but only if an unmanned rocket lifts off earlySaturday as planned. Butterflies are slated to get anothershot at surviving life aboard the International Space Station. Thousands ofstudents plan to join scientists in watching NASA's space shuttle Atlantislaunch to the space station on Nov. 16 with a cargo of two butterfly species,apparently undiscouraged by last year's experiment where caterpillars in spacefailed to emerge from their cocoons. The six astronauts preparing to blastoff on the space shuttle Atlantis Monday have arrived at NASA's Floridaspaceport to prepare for launch. A Russian rocket launched into spaceTuesday carrying a brand-new docking port for the International Space Station. Here's something to tweet about: NASAhas invited some Twitter followers to view the November launch of space shuttleAtlantis in person during a NASA "tweetup." NASA has pushed back the launchtarget for the space shuttle Atlantis to Nov. 16 ? a four-day slip ? to giveits new Ares I-X rocket an extra chance to blast off, agency officials saidMonday. The space shuttle Atlantis rolled outtoward its Florida launch pad early Wednesday to prepare for a Novemberliftoff, even though NASA is still unsure of exactly when the spacecraft willfly. CAPE CANAVERAL - Two planned rocketlaunches, short shuttle launch windows, traffic congestion at the InternationalSpace Station and two meteor showers could conspire to push space shuttleAtlantis' planned November flight into the new year. SPACE.com's complete coverage of NASA's STS-114 Return to Flight mission. SPACE.com's complete coverage of NASA's 2003 Columbia accident.